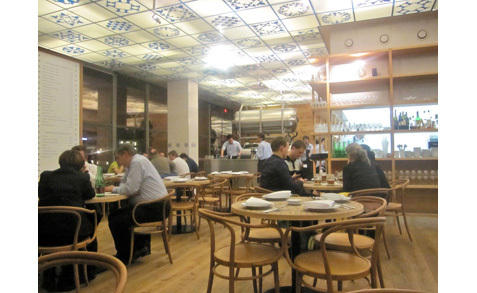 The Ambiente Restaurants Group has opened a number of the city’s best eateries in the years since. Sadly, the Mánesova location closed recently and I am going through Carolina wing withdrawal. 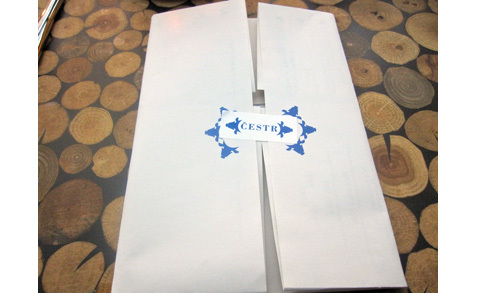 At the same time, they’ve just opened a new restaurant called Čestr. It’s in the completely done over space once occupied by Zahrada v Opeře (Garden in the Opera) next to the State Opera. It’s in the building that was once the Czech Federal Parliament, later the Radio Free Europe headquarters, and is now an annex to the National Museum. 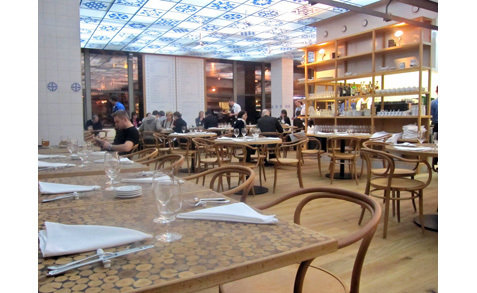 Inside, it is a very bright, wide-open space with simple round tables and basic chairs. 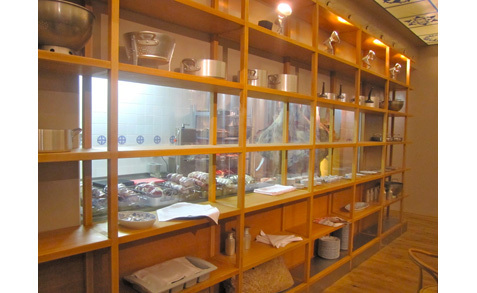 There is a busy open kitchen. There are big tanks for the fresh-brewed, unpasteurized Pilsner Urquell direct from the brewery. 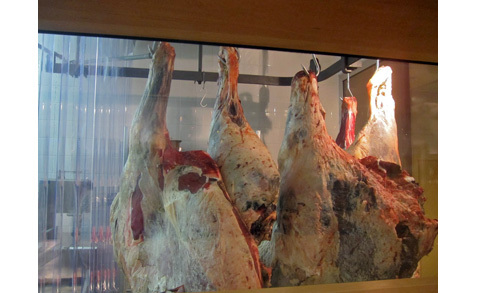 They have a meat locker with windows for viewing whole sides of Czech beef. I looked in and could actually see tags detailing the cattle’s birth date as well as its… let’s say expiration date. The varied designs on the ceiling that look like blue snowflakes are actually just cut-outs of steer heads arranged in different patterns. There are even decorative meat hooks hanging from the ceiling. The whole restaurant is non-smoking. I arrived for my first visit and received their folded paper menu. Offerings vary from day to day. Right now, they only had Czech-language menus. 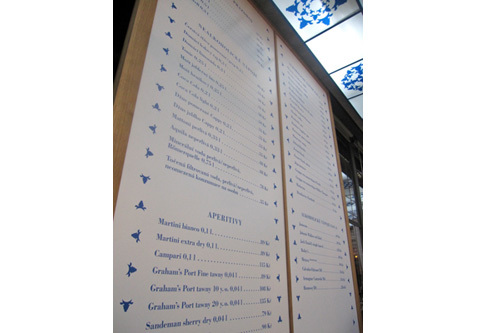 If you want a cheat sheet, there is an English-language sample menu on the Internet. Inside the folds, there was a card with tongue-in-cheek explanations of the restaurant’s philosophy and the origin of its name. Čestr is a shortened version of Český strakatý skot, which is a type of Czech cattle. The credo: small portions are good, they wake up the taste buds. A waiter arrived promptly and delivered what was to be the first of many new experiences. It was an amuse beer, if you will. 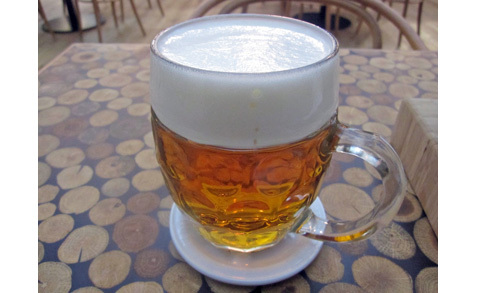 A small tasting glass with a swallow or two of 18 degree Master dark beer, topped with foam from regular Pilsner Urquell. Cookie crumbs were sprinkled over that. It was… interesting. Taste buds awoke. 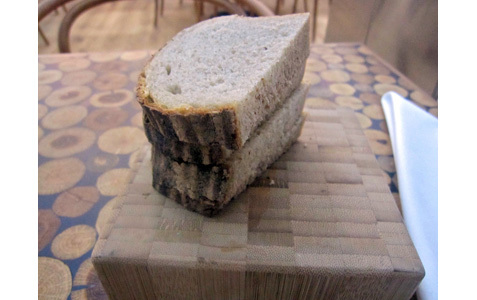 Next came a little butcher block with a few slices of excellent, recently baked Czech bread. It was better than you’d find at most places, with an earthy, smoky flavor. Of course, I was in the mood for a larger beer. 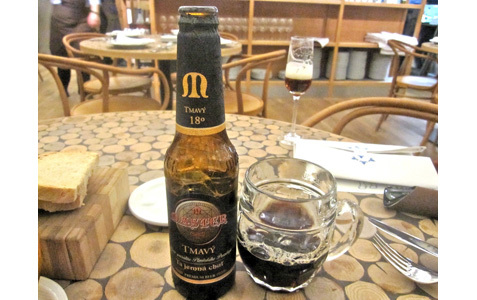 Čestr serves tanked Pilsner Urquell which is delivered direct from the brewery and unpasteurized (40 CZK). Crisp and cold, it’s as good as it gets. Their drinks menu is only posted on the wall and online. Many of the beverages are over-priced. A shot of Becherovka was 78 CZK, a .2 liter Coke was 55 CZK, a .3 liter glass of homemade ice tea was 55 CZK. They charge 35 CZK per person for an unlimited amount of filtered sparkling or non-sparkling water. I know filters aren’t free, but that’s still pretty steep for tap water. I ordered an appetizer of their beef “sashimi” (145 CZK). Don’t let the close-up give you the wrong impression. This is a small portion on a small plate. 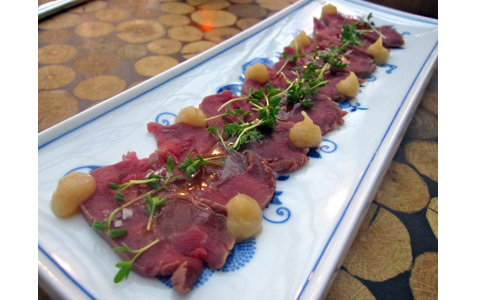 But there was no denying that the very fresh slices of raw tenderloin had big flavor. It was dressed with what the waiter said was a Ponzu sauce which is made with mirin (a sweet rice wine), and citrus. It was lightly spicy, salty, and sweet. There was also apple jam with ginger, though I didn’t taste much of that. It was more like little dabs of apple sauce. I liked it. It was served on one of those little butcher blocks along with a small, sharp, folding knife shaped like a fish. I had one problem with it. It wasn’t tough, but it wasn’t tender either. There was a proper ribbon of fat, but overall, the beef wasn’t well-marbled. I’m sorry if this wounds anyone’s national pride, but I have never thought Czech beef was very good compared with imports, especially from North and South America. And just a warning: I absent-mindedly picked up that folding fish knife upside down and when I attempted to cut the steak, I almost folded it on my finger. I like my steaks on the bloody side as long as it’s not mine. Sauces are extra. I got the Périgourdine (25 CZK). 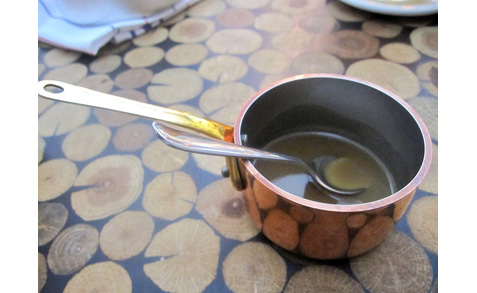 Served in a small copper pot, it is described as a demi-glace with duck liver and black truffle. 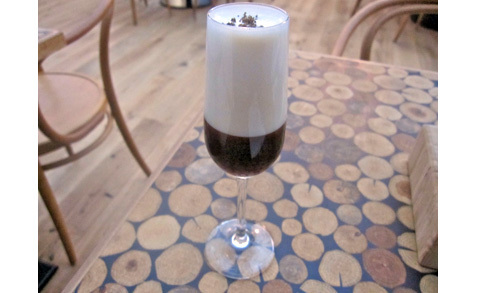 It was lightly sweet with a hint of mushroom. I did not find it particularly exceptional or complex. It did not compare to the amazing demi-glace that was once available, ironically enough, with the entrecôte at Ambiente’s Cafe Savoy. There was a separate pot for the fries (65 CZK). 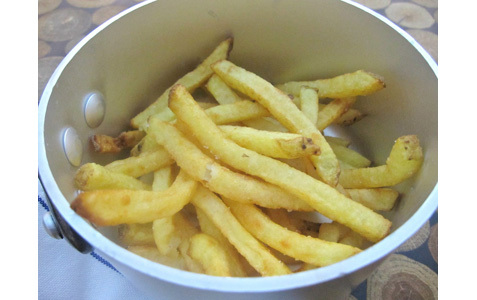 These are homemade and fried in sunflower oil. They were the best fries I have had in Prague — hot, crispy, perfectly sized, nicely salted and highly addictive. This is dangerous because side items are all-you-can-eat. I must add that I did receive one batch on another visit that were a little undercooked and not hot enough. 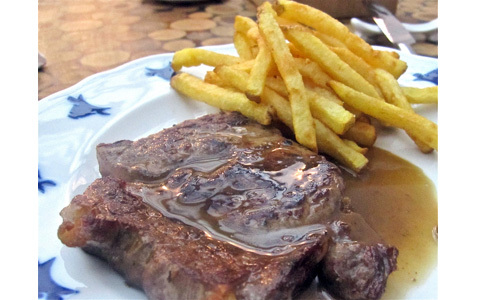 Once assembled on their cute zwiebelmuster-style cow plates, it was an enjoyable steak frites meal. Next. Dessert. Valhrona chocolate cake (125 CZK). Highly advisable. 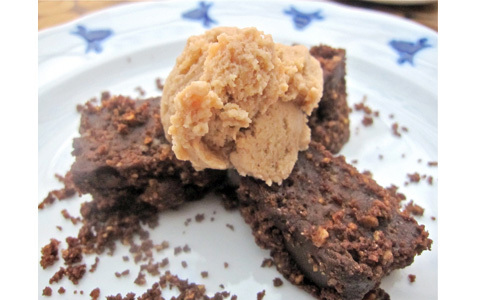 The three cold chunks of rich, fudgy chocolate were lightly laced with chili that produced a subtle, slow burn. Cookie crumbs gave it crunch. There’s an old show business saying: Always leave them wanting more. This dish certainly helped me to understand their small-serving philosophy more clearly. How would my taste buds ever sleep properly again? The service was friendly and blindingly fast. In some restaurants, that wouldn’t work, but here it felt normal. Finished plates were often cleared in a flash. 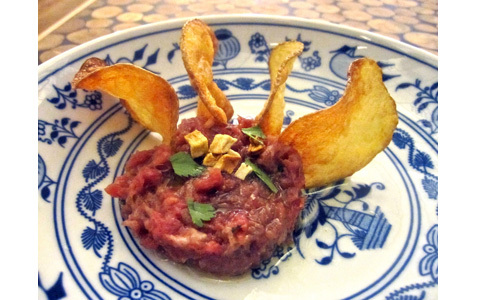 On the next visit, I started with the lamb tartare (135 CZK). The minced Židovice lamb is mixed with shallots, coriander, lemon peel, egg yolk and virgin sunflower oil. It was very fresh, but did not taste particularly lamby. The dominant flavor was cilantro, which I do love. It came with homemade potato chips, which were great, but not in sufficient quantity to support all the meat. I had the spinach salad with grilled chicken (125 CZK). True to form, the portion was tiny. 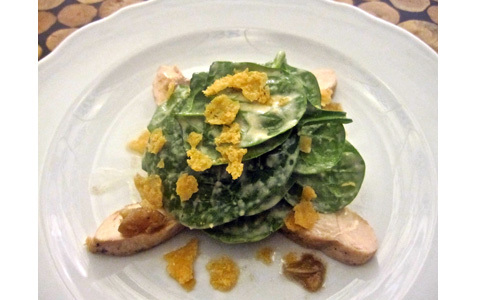 The leaves were thickly coated with a dressing made with Gran Moravia Parmesan. It was Caesar-like and delicious. There were pieces of garlic in there. 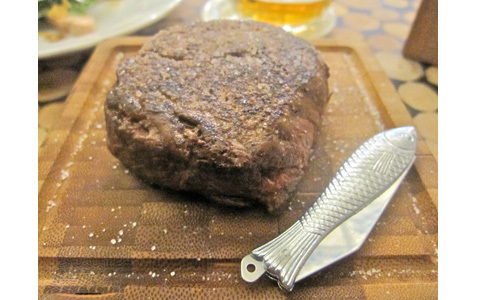 Then I had the 125 gram grilled beef tenderloin (185 CZK). It also was available in a 250 gram version. 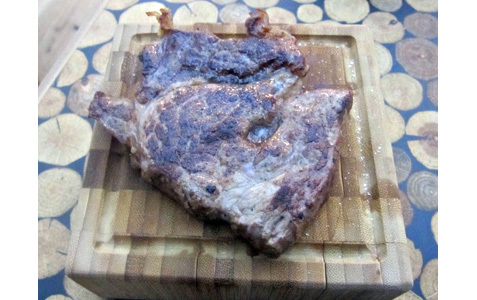 This was much more tender than my previous steak, but still not up to steaks from other regions previously mentioned. I coated the meat with their pepper sauce (25 CZK). 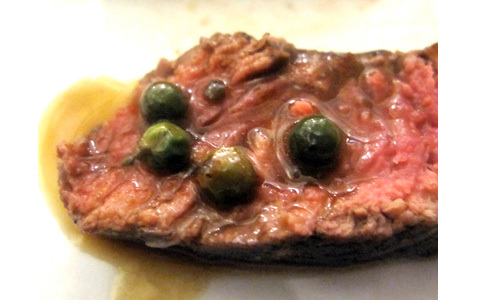 That is made with fresh green peppercorns, butter, demi-glace, and brandy. Biting into the peppercorns provided strong bursts of flavor, but I did not taste much pepper flavor in the sauce itself. It was a good complement, but again, I didn’t think it was great. For visit number three, I returned with my foodie friend, Jersey Girl. Not everyone I’ve talked to appreciated the interior design, she thought it was cheerful, interesting, and liked it. It was on this visit that I noticed that the chairs were not comfortable. Maybe that’s part of the wake-up plan, too. JG didn’t want a Pilsner, so she ordered the Master 18 degree. It only comes in a .33 liter bottle. It’s a rich, strong, dark beer. 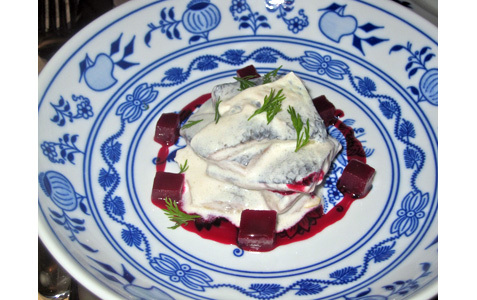 I started with the homemade matjes herring (118 CZK). 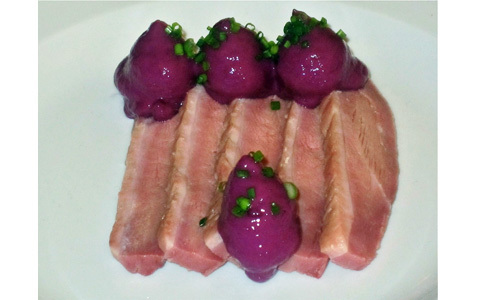 It was marinated in organic yogurt and served with pickled beets. I’m a major herring aficionado, but more for the fresh or brined version you can get in The Netherlands. This version was fairly standard, with very firm chunks of fish. It was just OK and not something I’d get again. JG ordered the tomato salad. She loved it. She noted that the skins of the cherry tomatoes had been removed. 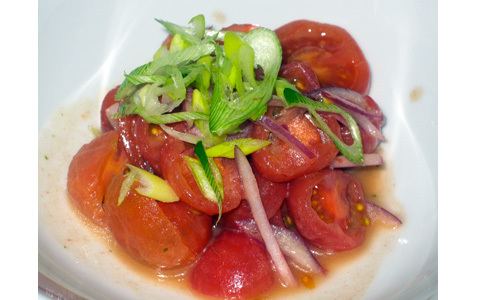 The sweet vinegar really brought out the essence of the tomatoes. It was simply mixed with red onion and leek. 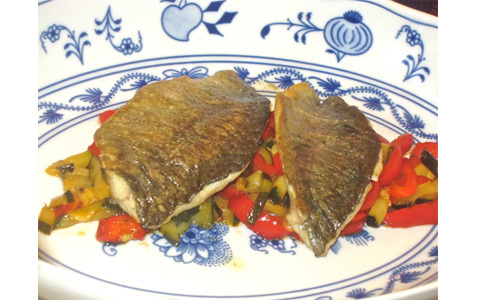 For her main, she had the trout filet cooked on butter (258 CZK). The fish sat on a bed of zucchini and peppers seasoned with thyme. The fish was pristine and fresh and perfectly cooked to a delicate state. There was one big problem. It was totally bland. She asked for salt, since there was none on the table. 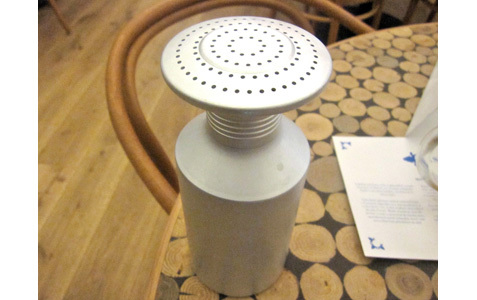 The waiter brought a comically huge salt canister that looked like it was originally intended for watering plants. They do believe in some large things, apparently. I had the beef ribs (165 CZK). I thought they were great. 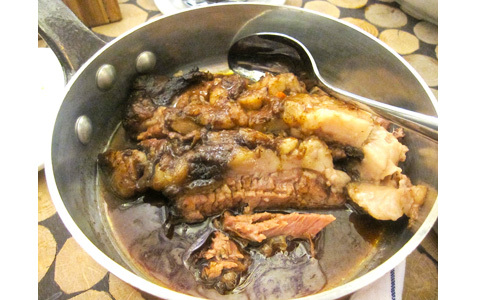 The menu states that the ribs are cooked in wine for 16 hours. They were boneless, fork tender, and there was a great deal of fat on them. It was easy to cut that off. The fat also made its way into the wine-infused, beefy sauce. A guilty pleasure. 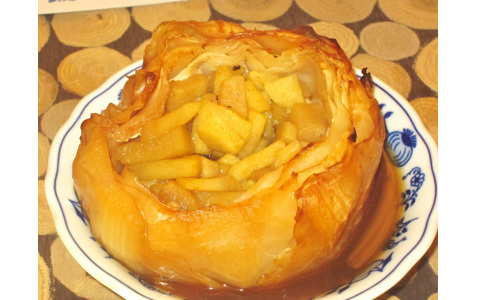 On the side, I had the roasted cabbage filled with apple (65 CZK). The diced fruit was cloying and tasted like sauerkraut. The cabbage leaves tasted like apples. It was a cute-looking concept, but the taste just didn’t work for me. I returned for a fourth and final time with a visiting American VIP from Vienna. 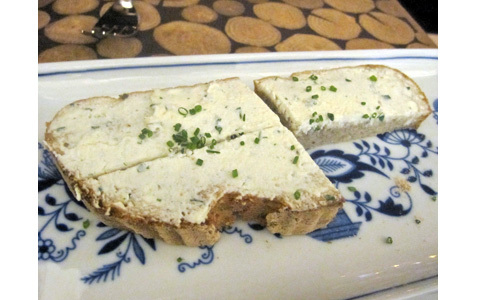 In addition to the usual unadorned bread, we also received a quartered slice with cream cheese this time. VIP had the tenderloin cooked medium. It was tougher and more chewy than the one I had. I think rare is the way to go with all the beef. I wasn’t so hungry and just got the smoked duck breast starter (96 CZK). I’ve never had duck quite like this. It was incredibly soft, almost gelatinous. In both taste and texture, I found it indistinguishable from ham. Even though other restaurants have failed in that location, I have little doubt it will succeed. I’d consider it one of the best dining and beer drinking options around Wenceslas Square. That said, there’s not a lot of top quality, good value competition in the immediate area. If my prime goal is steak, Čestr would not be my first choice. Personally, I’d go for the rib eye at El Barrio de Ángel, the tenderloin with Chianti reduction at U Emy Destinnové, or the rib eye in the low-rent surroundings of Crazy Cow. 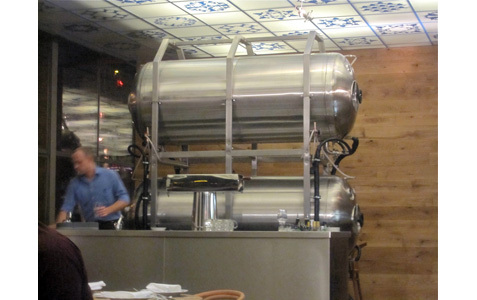 Čestr is definitely worth a try, and I’ll be back, I’m sure — especially for the great beer, fries, and peanut ice cream. 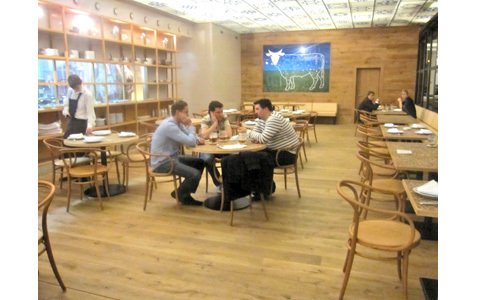 I went to Čestr four times because the concept intrigued me. I’d never seen anything quite like it before. I’m still not exactly sure what to make of it or even how to categorize it. Calling it a steakhouse seems wrong, but that’s as close as I’ll get for now.